Welcome back to another new post on IBeautySpy! Hope you are enjoying these reviews! Today I will be reviewing a popular and widely available night cream in the market. Himalaya is not my favorite brand as such, as I like only couple of their products – Himalaya Revitalizing Night Cream and Strawberry Shine Lip Balm. But their Revitalizing Night Cream was superb which is the main reason that I attempted to try this another variant of Youth Eternity Night Cream when it was newly launched. As the name says, this is a night cream meant for anti-aging and am always drawn towards such products. For who among us doesn’t want to reverse the clock and flaunt younger looking skin? 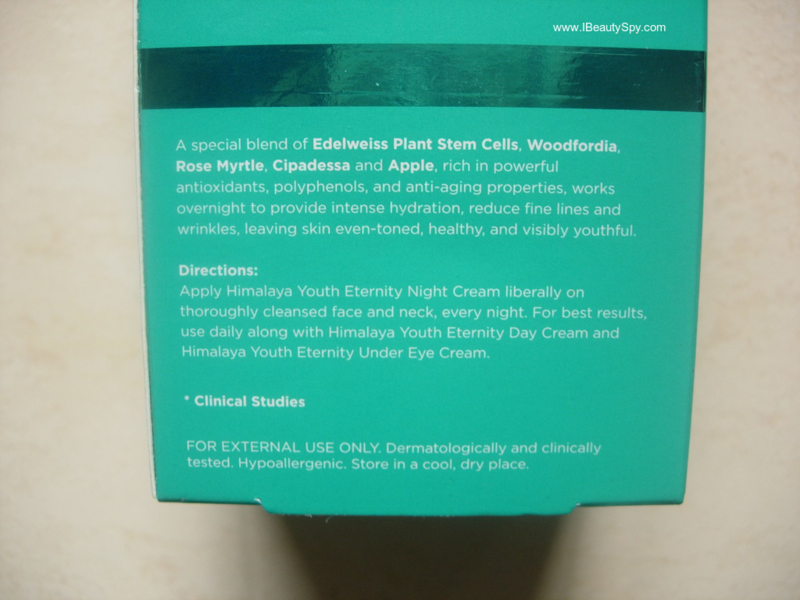 So did Himalaya Youth Eternity Night Cream fulfill its anti-aging claims? Continue reading to know more. * 97% of consumers noticed substantial improvement in skin tone. * Visible reduction in fine lines and wrinkles in 4 weeks. * 100% of consumers experienced significant improvement in skin hydration. * 92% of consumers noticed increased skin elasticity. – Edelweiss Derived Stem Cells: Found in the Alps in Europe, Edelweiss has proven antioxidant, anti-aging, and skin conditioning properties. – Cipadessa, Rose Myrtle and Woodfordia: These herbs promote skin elasticity and hydration, improving the Skin Cell Matrix to fight signs of aging. – Apple, a natural astringent, works as an effective antioxidant and conditions the skin. 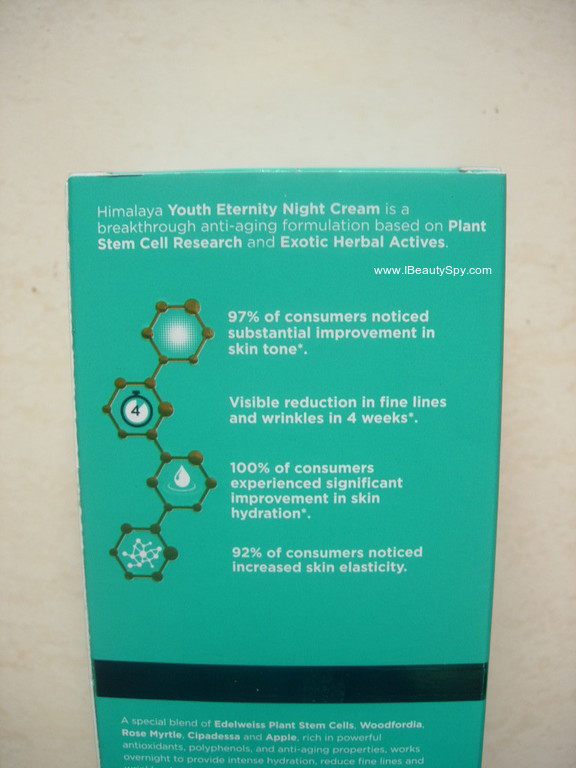 Himalaya Youth Eternity Night Cream comes in a nice teal green color packaging with all the details printed on the outer cardboard packaging. Inside, there is the product with a small pump dispenser with a transparent cap. This makes the packaging travel-friendly and it doesn’t leak. Himalaya Youth Eternity Night Cream looks white in color with a light baby pink hue. I love creams which are pink colored for some reason or other 😊 The fragrance is pleasant, slightly floral and not bothering much. The texture of the cream is creamy and slightly thicker than the Himalaya Revitalizing Night Cream but not as thick as usual night creams. I just take around one pump of the Himalaya Youth Eternity Night Cream and dot all over face and then massage it in. Though it looks thick, it gets absorbed so easily and leaves a matte finish. It doesn’t clog pores and didn’t cause me any breakouts. So it will suit all skin types. If you have very dry skin though, you might need to use a facial oil prior to applying this, which is what I do. I have been using Himalaya Youth Eternity Night Cream regularly for a month and the end results are that my skin is softer, hydrated and plumper. My skin feels more even toned. My face looks more healthy, youthful and skin elasticity also improved. I have also observed some reduction in fine lines on my forehead. Yes, within 4 weeks as claimed. So the Plant Stem Cell technology is working I guess! Himalaya Youth Eternity Night Cream is reasonably priced compared to most other anti-aging creams in the market. Also keep an eye on it on Amazon as many times Amazon has good offers on this Himalaya Youth Eternity range. I got this one from Amazon for just Rs.189 which is a steal deal 😀. 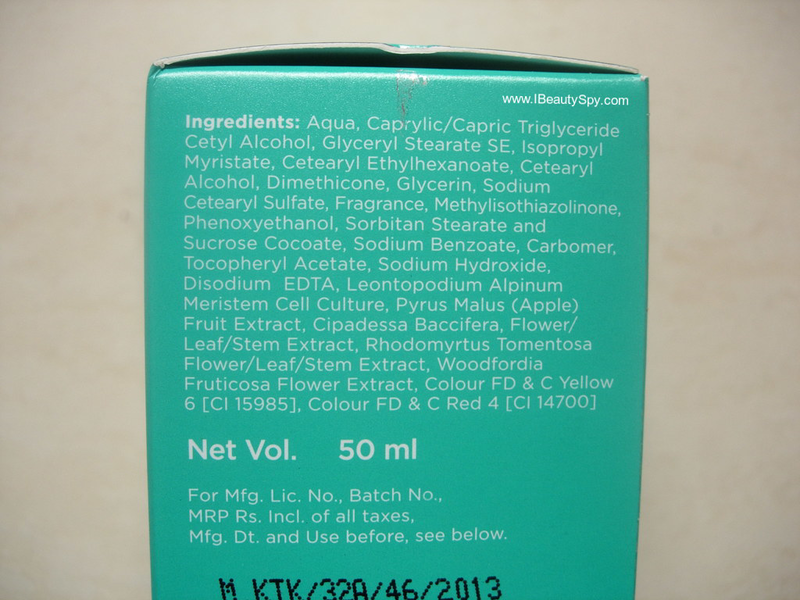 The ingredients list of Himalaya Youth Eternity Night Cream contains a blend of some exotic flowers and fruits. The stem cell technology ensures deeper penetration of these ingredients into the skin due to smaller molecular structure of stem cells. Which is more beneficial for the skin rather than using the raw form of natural ingredients. However, remember that this is not an entirely natural product and does contain silicones, fragrance, colors, etc. If you are confused between choosing Himalaya Youth Eternity Night Cream and Himalaya Revitalizing Night Cream, I would recommend you to go for the Youth Eternity one only if you have anti-aging concerns. If you are just looking for a normal night cream to repair and replenish your skin, then Himalaya Revitalizing Night Cream works brilliantly as well. The texture of this one is also gel-cream and slightly more hydrating (water content) than the Youth Eternity one which is more on the moisturizing side (creamy). Also it contains tomato and white lily extracts which help brightening skin in the long run. 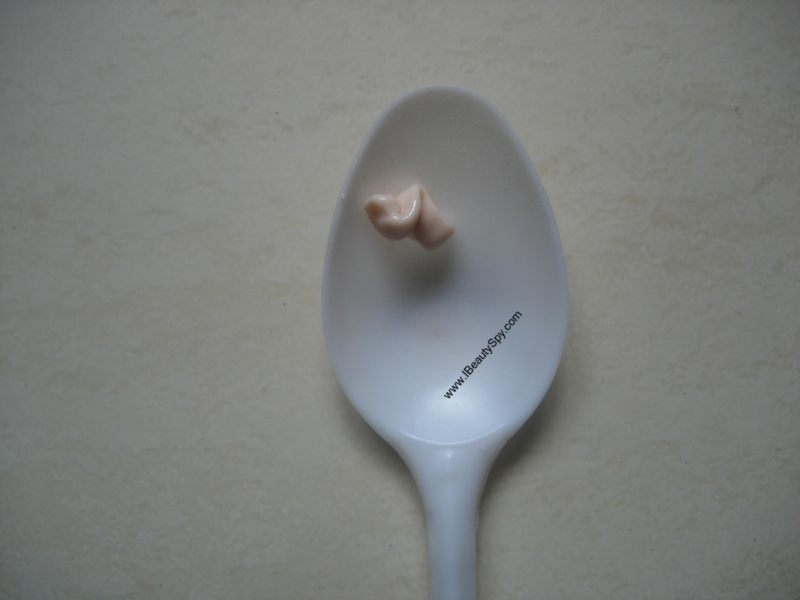 * Medium consistency, not too light or too thick. * Doesn’t make face greasy or oily and gives a matte finish. * Makes skin softer, hydrated and plumper. * Gives healthy, youthful skin. * Minimizes fine lines in 4 weeks as claimed. * Impressive ingredients list of stem cells of exotic flowers and fruits. * Mild floral fragrance which is not bothering. * Reasonable price for an anti-aging cream. * Doesn’t clog pores or cause breakouts. * Contains silicones, fragrance and colors. Yes, if you are looking for a good anti-aging night cream. Overall, Himalaya Youth Eternity Night Cream is a good, affordable night cream which satisfies all its anti-aging claims. Am not sure if it will work on very matured and wrinkled skin, but for those in their twenties and thirties with fine lines, this is a very good option. Unlike other anti-aging creams, this is not very heavy and so would suit all skin types. If you don’t mind the silicones, colors and fragrances, you can give it a try. But if you are looking for a 100% natural anti-aging cream, check out my review on Imiana House IMBOTOX Anti-Aging Moisturizer. That’s all folks for today! Will see you in another new post! Sans the presence of silicones this sounds like a great night cream.